This is not the proudest blog post that I’ve ever written. But I feel that it’s only fair to let you see my experience of criticism versus feedback. When I was younger, two of my character traits worked together to make me a very difficult person to work with at times. Those traits were perfectionism and impatience. In my head and in my world, everything had to happen fast and flawlessly. And it wasn’t just fast – it was fast according to my definition, meaning “immediately.” Growing up, sayings like, “If it’s worth doing, it’s worth doing excellently,” and, “Do it right the first time, every time,” permeated my world. As a young employee, I was an asset to a number of managers: my standards were high and I pushed myself to learn as much as possible in as little time as possible. Things became a little messy when I was first promoted to a managerial position. I took the responsibility of my department’s success very seriously and no-one’s sloppy work was ever going to derail me. Everything that I didn’t think was of a very high standard, deserved… yes, you guessed it: harsh criticism. I would point out everything that was wrong with a project, space or person in a jiffy, and without sparing anybody’s feelings. After all, I was just talking the truth, wasn’t I? Even worse, I didn’t offer someone a conversation where we talked about an issue, discussed ways to make it better, and left in good spirits. I simply told people what they’d done wrong and how much I disapproved, and then expected them to find their own answers. I was able to find mine, so why couldn’t they find theirs? I’m ashamed to admit that the number of people I had in tears during my tenure as a young manager are too many to count on two hands. I then had the good fortune of one of my bosses spotting my potential and realizing that I needed guidance. He became one of my most appreciated mentors ever. He taught me how to give feedback, rather than criticize. He coached me the way he wanted me to coach others. Whenever he had a feedback conversation with me, I left knowing what I had to work on. I also always left with hope, feeling supported, and knowing that, although he wanted me to grow and develop, he still accepted me. It’s a gift I’ve been trying to pay forward ever since. Is It Criticism or Feedback? 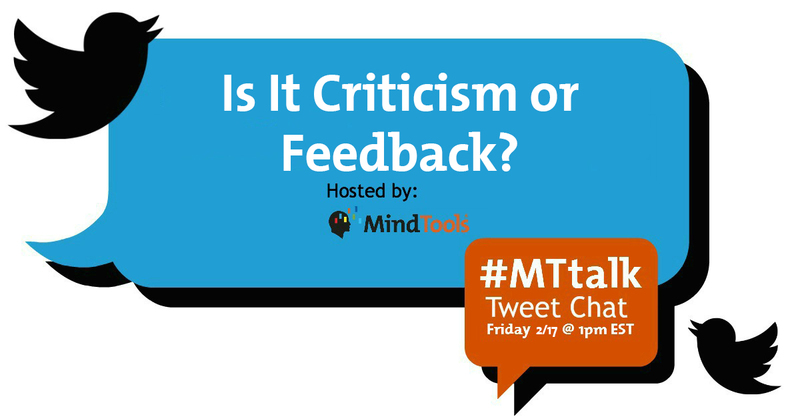 Last week’s #MTtalk Twitter chat was titled, “Is It Criticism or Feedback?” Here are the questions we asked and some of the responses from our participants. Question 1: Is criticism the same thing as feedback? Why? The responses were clear cut: criticism and feedback aren’t the same. @WonderPix I think a lot depends on the intention – is it meant to help or hurt? @ankitapoddar Criticism focuses on misses. Feedback focuses both on strengths as well as growth areas. They can never be the same. @JulieMRodriguez Criticism has no intention to help, only to sting; feedback is from the heart and has intention to support & assist. Question 2: Why do you think people criticize others? @SayItForwardNow I believe criticism comes from a place of fear and feelings of inferiority. @70mq They feel threatened by your competence. Question 3: What preconceptions can affect how you hear feedback, and how can you avoid confusing feedback with criticism? @amypen64 Hard one for me. Being brought up in a negative household, I fear feedback and take it as criticism. @harrisonia One’s state of mind before the interaction (criticism) occurs can heavily influence how the information is received. @SaraRankin5 That there’s only one right way. Question 4: How can you prepare yourself to receive feedback/criticism well? @SistadaHealer Listen with an open mind & closed mouth; don’t take it personal – everything is a learning opportunity. @SnowinRI By thoroughly listening to, without interruption, before even uttering your rebuttal. Two ears, one mouth: there’s a reason for that you know. Question 5: How would you deal with unfair, undeserved criticism? @TalentExch_Biz If things turn sour, ask to reconvene when everyone is calm and you can collect thoughts, documentation. Don’t tolerate abuse. @PG_pmp It is difficult to stop others, the best approach is to review yourself. If things are good, then keep cool. @NWarind Will try to find the justification if there’s any. Question 6: In the workplace, is it ever right to criticize someone in public? Why? @EdNavigation Only if it’s a safety or danger issue. Otherwise, no. Enemies emerge quickly when respect is lacking. @maat333 When it’s with respect and constructive, and there’s a benefit for the group (even as a lesson), sometimes it’s necessary. Question 7: What goes wrong if no one gives feedback? All the participants felt that feedback is necessary for sustained growth. @FloraBarton Things may stay the same – or areas for development may never be realised! The status quo may never be challenged. Question 8: Have you ever avoided giving someone feedback? Why was that? @E_Toohig When I perceive they are not open and ready for my honesty. @MduduziTNtuli I always give feedback because it’s important to give feedback for a person to excel. Question 9: How does feedback/criticism differ one-on-one compared with online or written? @MicheleDD_MT Recommend that constructive feedback not be online/written. Can be misinterpreted. Cannot clarify intention or get specifics. @Midgie_MT For me the difference is when said in person, you hear it, digest it and it’s done. Also can get immediate clarification. Question 10: When giving feedback, how can you make sure it doesn’t sound like criticism? @Yolande_MT Begin and end the feedback conversation on a positive note. Remember that it’s not a blame-and-shame session. Giving feedback is a key part of coaching. How successful is your manager in coaching you? Please cast your vote in our Twitter poll here. In our next #MTtalk, on Friday, March 3, we’ll discuss “Coaching Skills for Managers,” a topic suggested by one of our regular participants, @PramodDrSolanki. We’ll look at different ways of coaching and discuss the impact of coaching on performance. Please join us at 1pm EST / 6pm GMT. To participate in our chat about coaching skills for managers, type #MTtalk in the Twitter search function. Then, click on “All Tweets” and you’ll be able to follow the live chat feed. To join the conversation, simply include #MTtalk in your tweet and it will show up in the chat feed. Thanks for your comment, Julie. The #MTtalk Twitter chats are proving to be very educational and it’s great to learn from people from all over the world. Please feel free to join in every second Friday – the next one is this week (March 3).